We have a fine excuse to give the wonderful Ramen O-San Bar another plug after moving to Chinatown's most glorious Sussex Centre Food Court. We loved O-San's characterful Dixon House digs which would have been too ramshackle for some. O-San's new stall in Sussex Centre is upbeat and sparkly, better reflecting the quality of their fine merchandise. After their Dixon House stall closed a little birdie told us the owners went back to Japan. 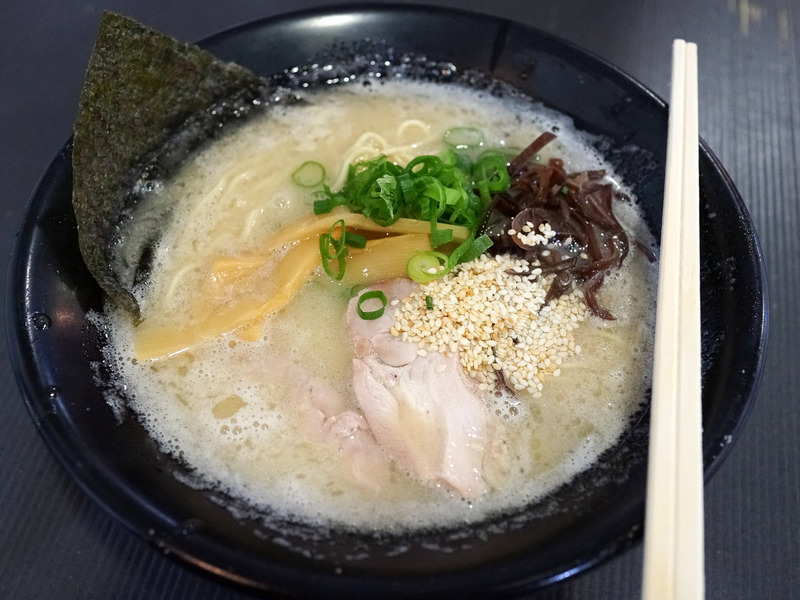 But the little birdy bull-tweets because Ramen O-San is back and kicking buttocks. The new stall is busier than the old one, probably having nabbed some customers from previous occupant, the once great Ramen Ikkyu, which went a bit south, we think after changing hands. Most importantly, O-San's ramen is still awesome, one of the very top ramen joints in town at the moment we reckon. As always, we end our rant by nagging you to get in an try it now - you just never know how long this joint will be around or change hands. 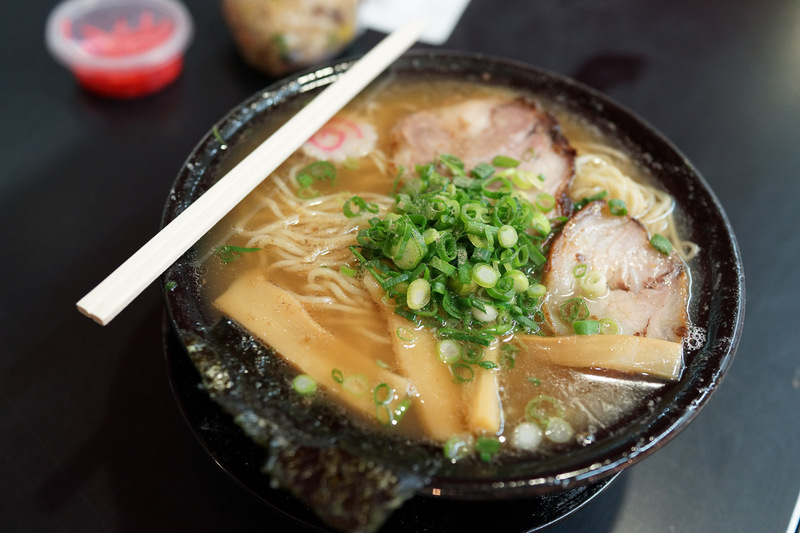 Mr Shawn spent the early years of this blog chasing a ramen style he chanced up in Japan - hakata ramen ($12.00) - a much lighter tonkotsu (pork bone broth) that has mildy porky flavour and a heavenly milky consistency. This one is a beauty, to the point we went back a week later to try it again, just to make sure. It was a little different the second time, possibly from a different end of the pot, we love it. 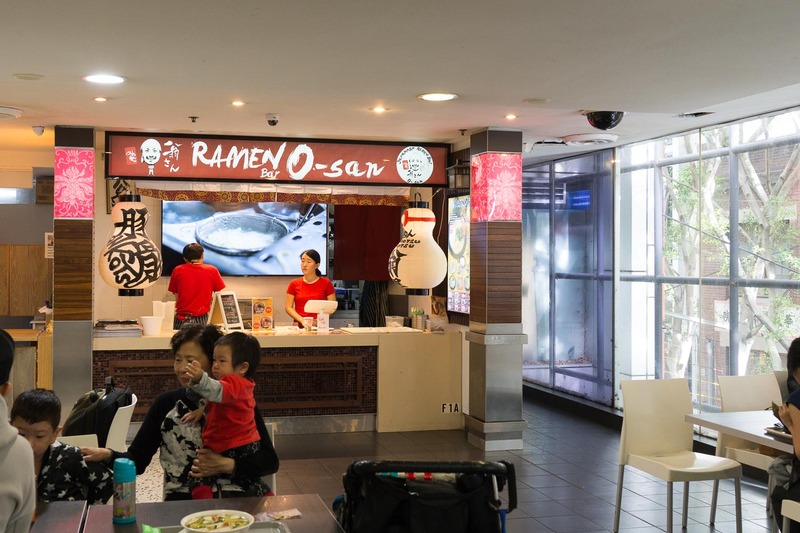 (Our other favourite for this style of ramen is still Hakata Ramen which has been feeding throngs of homesick Japanese tourists and expats in Surfers Paradise for many years). Alison is a bigly fan of black ramen - $12.50. 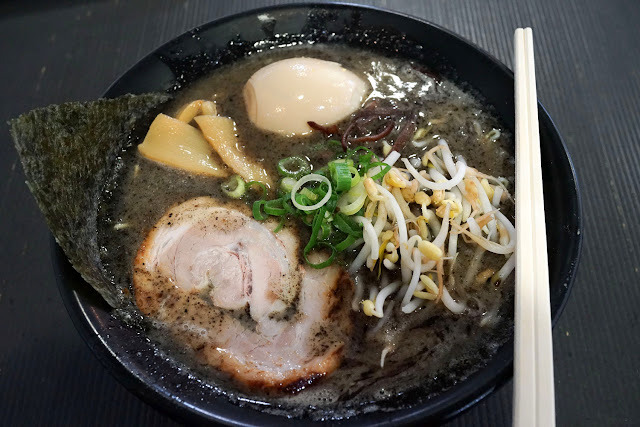 A light tonkotsu zinged up with black garlic oil. Today's special is a Niboshi Dashi Ramen ($15) - the broth is flavoured with dried sardines giving it that fishy kick that we so adore in ramen. 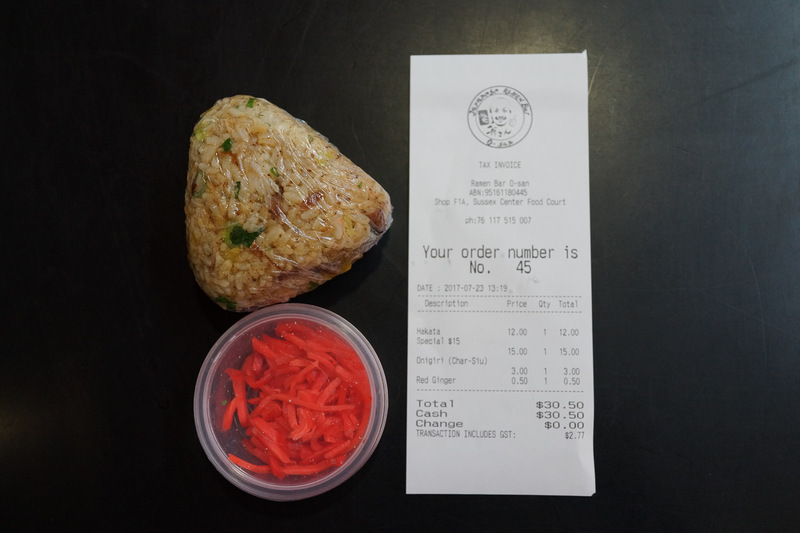 We highly recommend you grab a char-sui onigiri ($3) - a wedge of rice with rich porky offcuts. Save it for laters and you have a very cheap and happy lunch or the basis for dinner, it's rich so it goes a long way. We don't just recommend you buy one, we insist. Alison whines that she has to pay extra for pickled garlic like you never do in Japan, but hey, it's fifty cents, get a life. 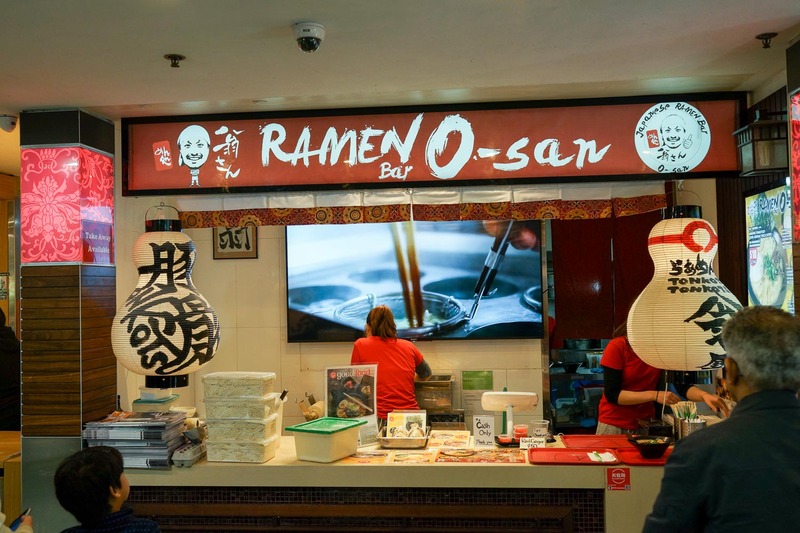 Ramen O-San Bar is the Sussex Centre of excellence, 401 Sussex Street, Chinatown. Head up the escalator into a sublime netherworld of happy happy joy joy. I agree this is a tops ramen establishment. I also baulk at having to pay for the condiments and they often give you too much, so it seems wasteful. But I love the large variety of extras - egg, fantasticly flavoured pork belly and my favourite, extra menma.